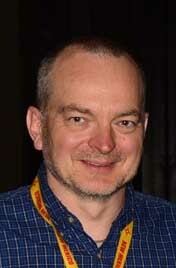 Ian MacKellar is Master Santa Fe Modeler #3. He has an interest in 1920s and 1930s Santa Fe models. 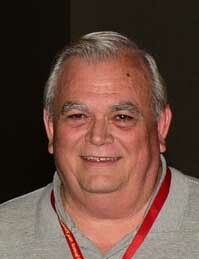 Charlie Slater has lived in Bakersfield, California since 1989 and before that in Needles, CA from 1984-1989. He grew up in Lakewood, CA. 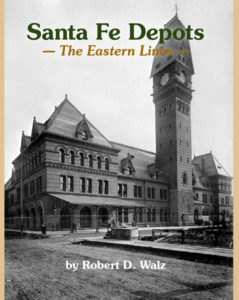 When he went to work for Santa Fe he just relocated with his job when he needed to do so. 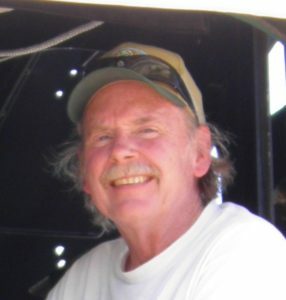 Charlie worked for the Los Angeles Junction Railway from 1970-1984 as a Switchman, and for the Santa Fe and then the BNSF from 1984-2006, when he retired with 36 years of service. 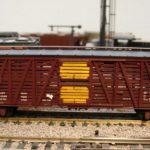 How did you get interested in modeling the Santa Fe? As a teen in the early 1960’s my train buddies from high school and I would ride our bikes up to L.A. on weekends and visit the Santa Fe and UP. East L.A. yards for the day. 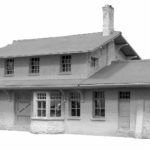 At that time you could go just about anywhere on railroad property with no problems. It was not uncommon to get a cab ride on switch engines around the yard. 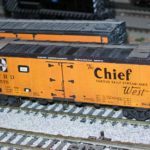 Sometimes if an east bound freight was sitting in the yard waiting to highball the Engineer would invite you up into the cab and give you a tour, of course when the Brakeman would start lining switches out to the main line it was time to get off. The Santa Fe people were always the nicest and I really liked their F-units colors. 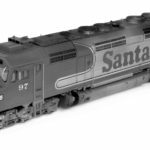 I started modeling the Santa Fe in 1961 as a teen member of the Long Beach Model RR Club and have been modeling it ever since never dreaming that one day I would go to work for them. What would you like to share with other modelers? 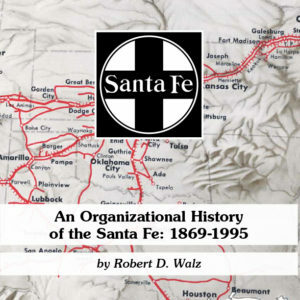 I always try to encourage people to model the Santa Fe as it was always one of the class railroads in the country, and everyone knows what the red/silver warbonnet looks like and what the Super Chief and El Capitan were. They always had an interesting locomotive fleet that was kept pretty clean. 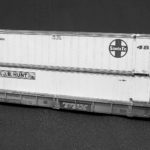 And for me they had a lot of their own design freight and passenger cars to make it interesting. I really would like to see more people building models instead of just buying them and taking them out of the box and running them. I really admire the people who take the time to build something and bring it to one of our conventions so we all can see what they built. Photos of Charlie’s work follow. Click on the photo to see a complete view (the gallery program clips the edges). Enjoy! A Red Caboose kit modified, painted and lettered. 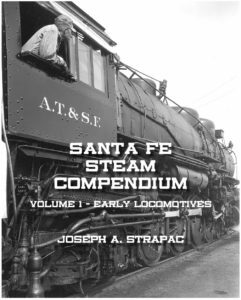 Won First Place in Steam Locomotives. 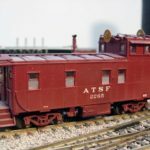 A heavily modified Athearn U-36C kitbash. 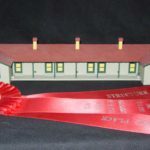 Santa Fe 10 man standard bunkhouse won Second Place in Structures. 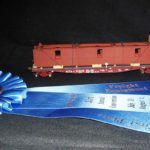 This flat car (Ft-N 91968) won first place. I made patterns that became Sunshine Models kit 66.1 in 2004. I made patterns that became Sunshine Models kit 61.3 in 2002. I made patterns that became Sunshine Models kit 89.2 in 2009. I made patterns that became Sunshine Models kit 90.6 in 2009. I made patterns that became Sunshine Models kit 94.1 in 2010. 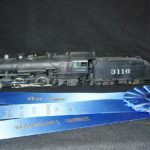 In Jürgen Dietrichkeit’s case, not only did his Vaughn, New Mexico depot win the President’s Award for Technical Excellence, it also won Best of Show and completed, with his prior ribbons and publications, the requirements for the Society’s new Master Santa Fe Modeler recognition, making him the first recipient. Photos of some of Jürgen’s models over the years appear below. We took the liberty to find out a bit more about Jürgen to share with our readers. 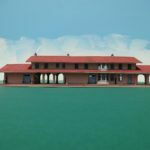 Congratulations to Jürgen for excellent and inspiring model work! Where do you live? I live in the city of Weilheim, south of Munich (native! ), Germany, in viewing distance of the Alps and less than an hour from places like Garmisch, Oberammergau and Neuschwanstein Castle, and less than two hours from Italy. How did you become interested in the Santa Fe? 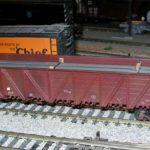 I got into trains through my Dad’s modeling Märklin since the early sixties. In his family were several career railroaders working for the Deutsche Reichsbahn (by-line: my Great-Grandfather was a railroad soldier who spoke four languages, and he was an interpreter at the signing of Germany’s WW I capitulation in 1918 at Compiegne, France), and Deutsche Bundesbahn after WW II. Visiting my mother’s pen friend in California in 1983 when I was a very impressionable 16-year-old. My first ever Santa Fe impression was a seven-unit, 128-car freight train in Barstow, something we just were not used to seeing in Europe! Touring AZ and CA on that trip gave many more RR impressions. 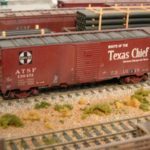 Looking back, it could have been SP or UP, but it was that pen-friend’s Dad who took me to the ATSF Bakersfield yard and up Tehachapi that got me “Santa-Fe’d.” I joined the Santa Fe Modeling Society in 1987 and started modeling Santa Fe fully in 1989. 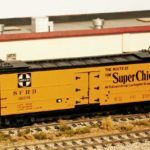 Since the ATSF died in 1995, my modeling world since then is ending on Sept. 21st, 1995. 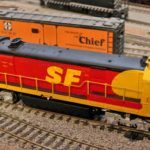 At that time, the Superfleet, international and domestic intermodal traffic, the Transcon pipeline of trains, all were in full swing. 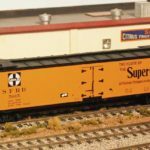 HO-scale was a natural choice for me but sometimes I wish I was in N-scale because of that better train-scenery ratio. I’m way too deeply invested now to change it. Recreating that certain date in time on the railroad as closely as possible (within reason) is what I’m striving for. 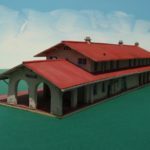 Modeling the Clovis Sub is what I decided on when we had that new house built in 2007. Busy single track, lots of local flavor (depots! ), little online traffic, super-hotshots, and my favorite RR location of all, Abo Canyon, got me inspired. I enjoy following and photographing the BNSF but I’m leaving it to my two teenage sons on the modeling side. My railfanning goes far enough to hire a helicopter in 2011 to fly over Abo and Belen, shooting pictures in a biting cold in January. 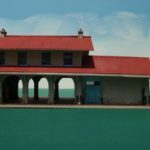 I have spread the spirit of US-style railroad modeling through my local network having inspired several local club members to build Fremo HO USA modules that we join twice a year to form a monster layout, attracting followers from Switzerland and Luxemburg. What I’m enjoying most, though, is the relationships and camaraderie with other “trainy” folks from all over the world. Many of those have become personal and family friends over time that come to see me and the layout, or are happy to have me (plus family) over at theirs. Some I got to meet out there shooting pictures at places like Curtis Hill in OK, or at mini-meets, train shows (Springfield, MA), or conventions (13 since Chicago 2000), or via the internet. Glad we got this kind of communication channels today! My hobby to this degree would not be possible without modern technology. Try modeling Brenner Pass in the seventies from over there without modern communication!